SINGAPORE - Your CPF fund is a suitable and safe product for secure retirement: Whatever you put into your fund will come out as your life payouts. 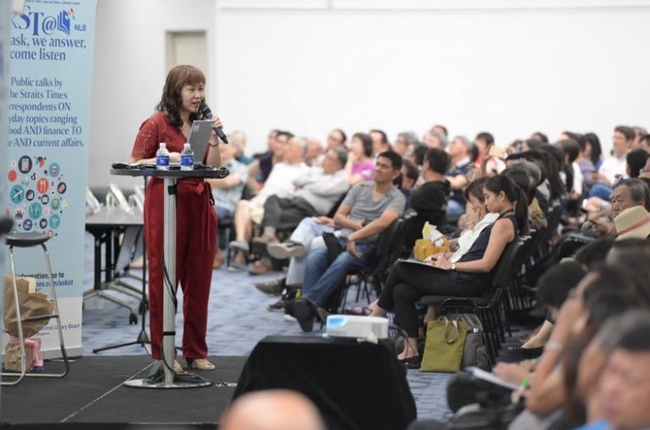 This was repeatedly emphasised by Straits Times invest editor and senior correspondent Lorna Tan to a packed audience of about 340 people at the Central Public Library on Friday (March 23), many of whom were taking down notes fervently as she spoke. Ms Tan was speaking at the ninth edition of a series of askST@NLB talks, entitled Retire Smart via CPF. The talks, held monthly since last July, are organised by The Straits Times and the National Library Board (NLB). Each session comprises a talk, often by a Straits Times editor or correspondent, followed by a question-and-answer segment. Ms Tan discussed the different CPF Life plans, breaking down the pros and cons of each plan and the factors one must consider in deciding which to choose. "For those who are worried about inflation and higher cost of living, the Escalating Plan is something you can consider that might counter that," said Ms Tan. She highlighted that, instead of level payouts, retirees who choose this new CPF Life plan, which was introduced at the start of this year, can expect monthly payouts that increase over time. This, however, might come at the expense of lower initial payouts. Those who are looking to save more for their loved ones can choose to opt for the Basic Plan. The plan offers lower payouts in order to save a larger bequest for nominees, while those needing higher level monthly payouts for themselves can settle for the Standard Plan. Ms Tan then went on to explore ways of growing one's CPF fund, a key topic of interest for the night not only for seniors, but younger adults as well. For instance, she suggested periodically transferring some money into one's Special Account (SA), allowing that sum to capitalise on the SA's relatively higher interest rate. "Even when you're young you have to think of how you can save long term. Making that a habit really saved me," shared Ms Tan. Said Mr Josh Quek, 64, after the event: "The talk was useful to me because some of the things, like the Escalating Plan, are very new to me." "It's also great to have a talk that I can come and listen to. It's more practical and informative than simply reading from a website or book," he added, saying that he had decided to attend the talk to ensure that he did not miss out on any information that he might not have found on the CPF website. A book signing for Ms Tan's book, Retire Smart, was held after the talk. The next askST talk on April 27 will feature Life editor Tan Hsueh Yun, who will speak about how social media has changed the way that chefs create dishes. Those interested may sign up at http://str.sg/askHsueh.